So…Baseball is Back! 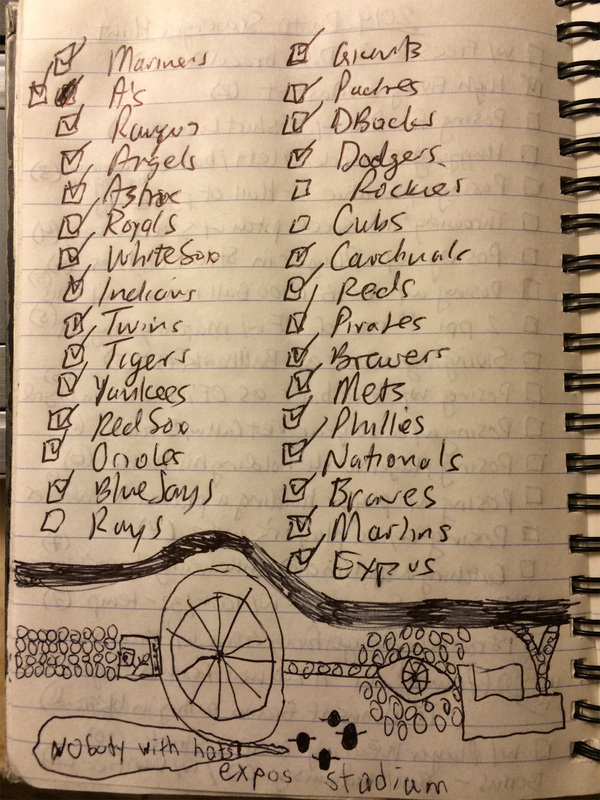 On March 28, 2014, we got our season off to a quick start, in a big way. I thought Tim and I had been to every MLB stadium. In fact, I’d been to 37 (all current plus 7 closed) and Tim had been to 34. 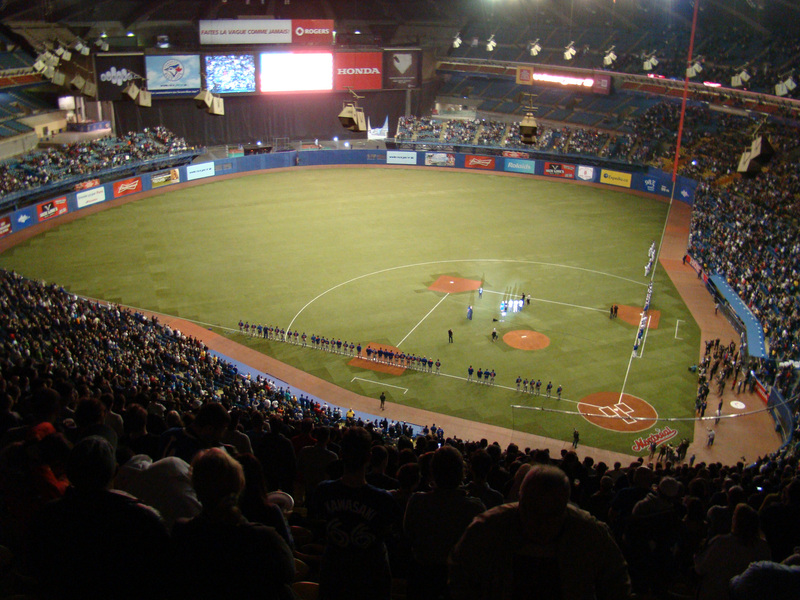 But over the winter we heard of an opportunity to add an old, new MLB stadium to our list: Stade Olympic (a/k/a Olympic Stadium) in Montreal, Quebec, Canada. We decided to make a weekend of it and, when my wife wasn’t up for the driving, we invited our old roadtrip buddy, Avi Miller. 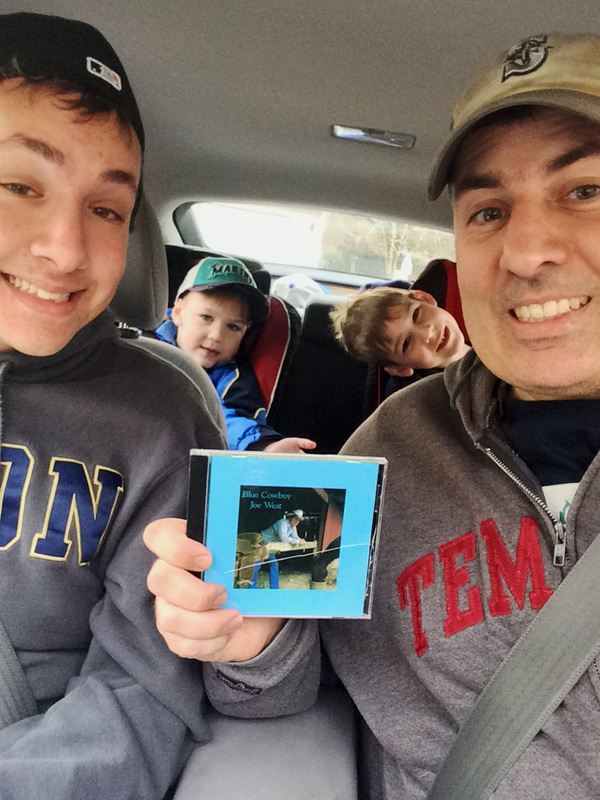 …popped in “Cowboy” Joe West’s “Blue Cowboy” album, and started driving north. We bunked at the beautiful La Quinta Inn in Latham, NY for the night, and then hopped back in the car and drove into the Great White North on the morning of March 28th. With my US-based GPS out of commission, we got lost driving into Montreal. But our ship was righted with the help of a helpful gas station/garage manager. Olympic Stadium was three miles (or maybe it was kilometers??) away from our hotel, but it was incredibly easy. The boys wore their winter jackets (which meant I got to lug them around all night inside the stadium), but they were not needed because it was possible to go from our hotel room to our seats at the game without ever going outside. Also, the Metro was fun because it runs underground like a traditional subway train, but it runs on tires – it’s like a bunch of huge electric buses linked together. So, after bording at Berri-Uqam and whizzing by Beaudry, Papineau, Frontenac, Prefontaine, and Joliette, we hopped off the train at the “Pie-IX” stop (a/k/a the “Half Felix” stop – actually, only we call it that, I think). Oh, yeah, look at that – there was snow everywhere. 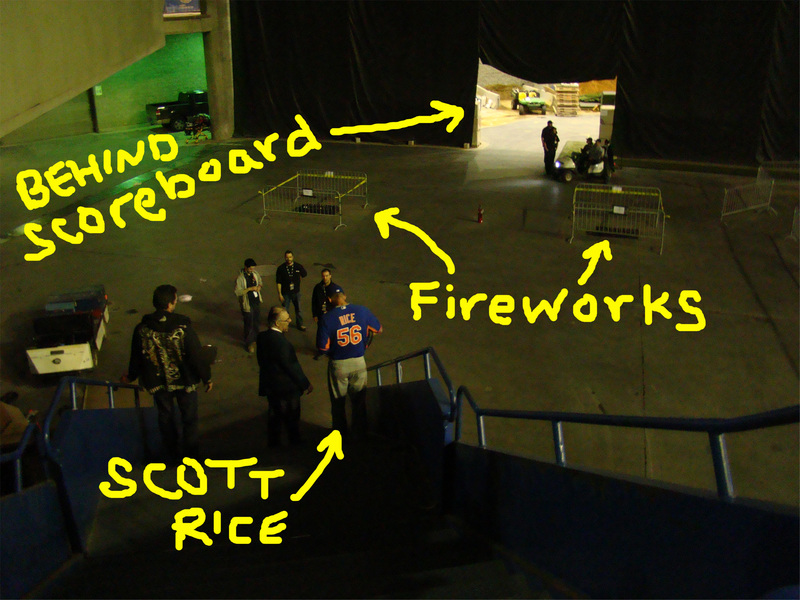 We thought we needed to walk outside to the stadium, but Avi had the bright idea of going back inside and seeing where that hallway would lead us since it seemed to be heading right to the stadium. And it did head right to the stadium. It took a second or two to realize, but once we noticed the table and garbage cans (behind the signs), it was evident that the signs were marking the bag check point to get into the stadium. So we took our place at the left side of the sign in the above photo. 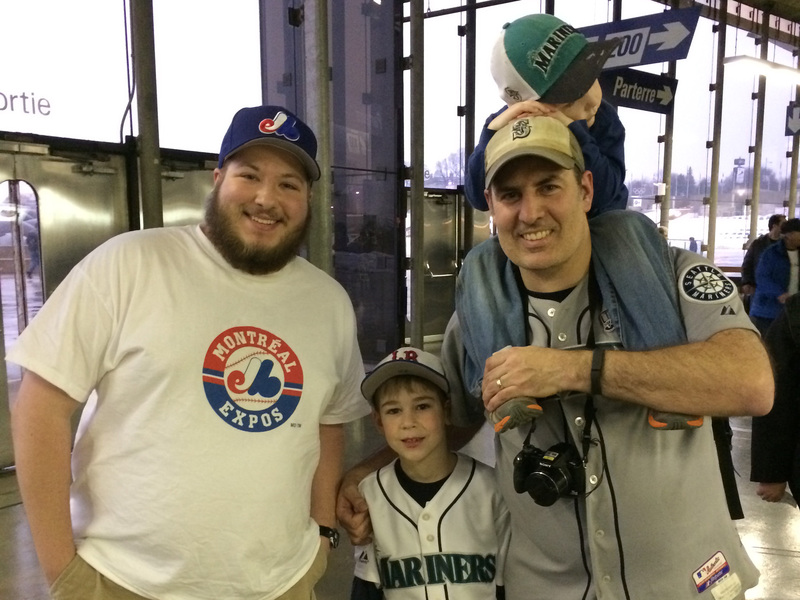 Standing to the right of the same sign was the mild mannered Quebecer pictured above with Avi and the boys. His name is Michel. He’s a member of MyGameBalls.com and he recognized us all when we walked up. We started chatting and ended up spending a lot of time with him over the weekend. He’s a quality dude. And it was great to meet him. This was a special day for Michel. 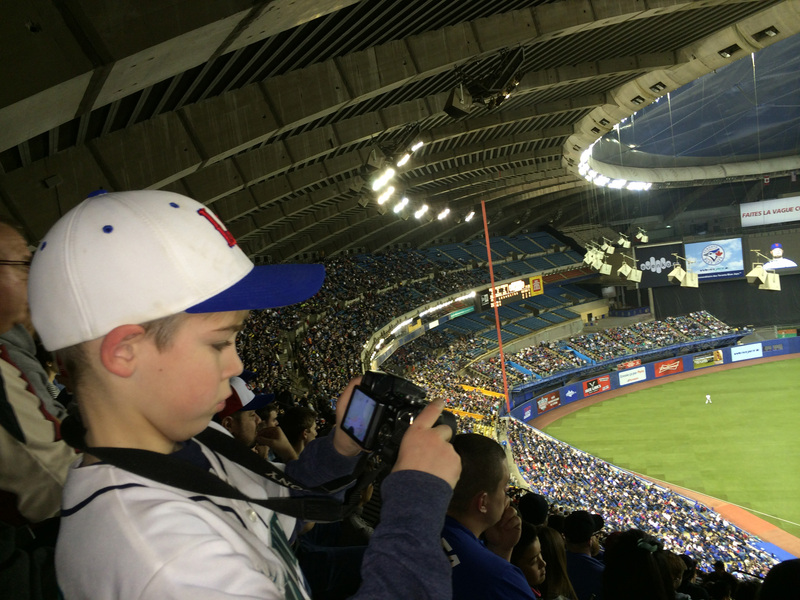 He’s been to about 15 or so MLB parks in the U.S., but the Expos left town when he was about 6-7 and he’d never attended a game at his hometown’s MLB ballpark. Michel let us in on the bad news that the stadium wouldn’t open until 5:30. That mean we had about an hour and a half to wait. …and started checking them off as we spotted them. 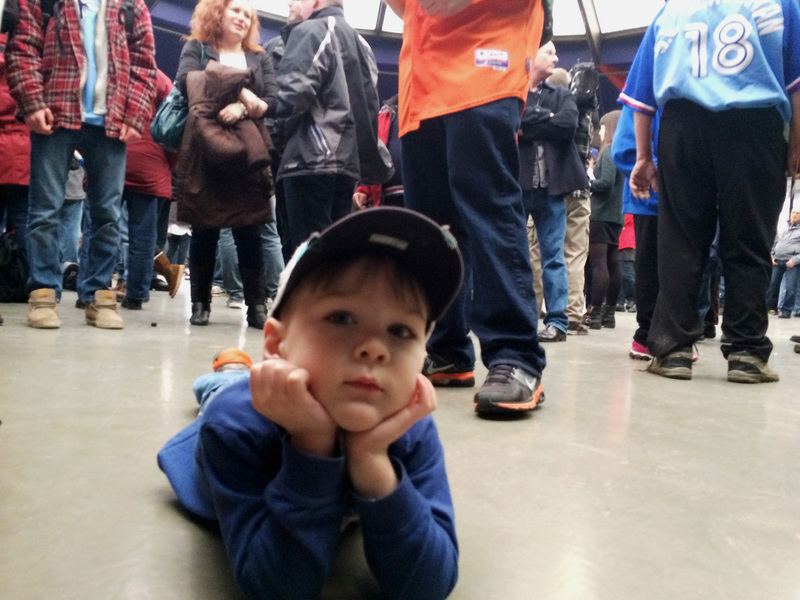 There were Expos fans everywhere. 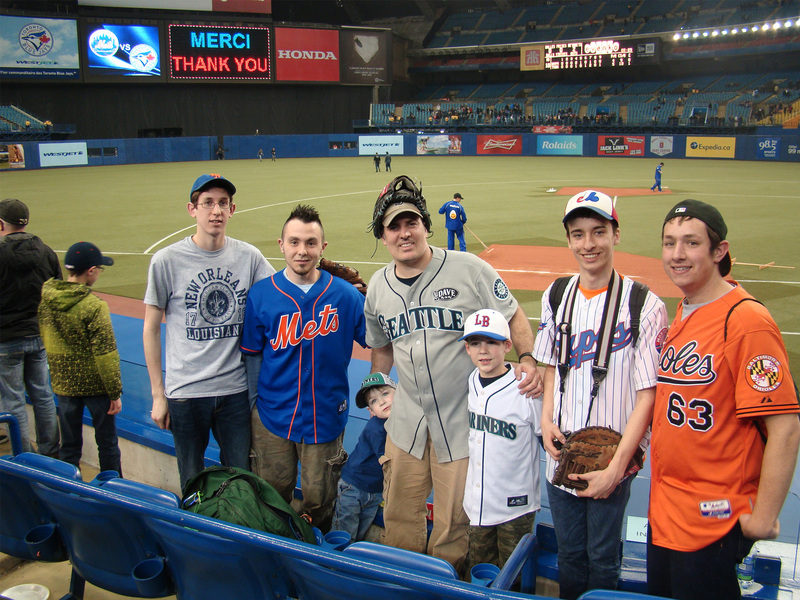 There were also a bunch of Mets and Jays fans since they were the teams playing. But we also quickly spotted Pirates, Braves, Dodgers, and Rangers fans. The crowd started to grow rapidly. …of a lot of those interview. 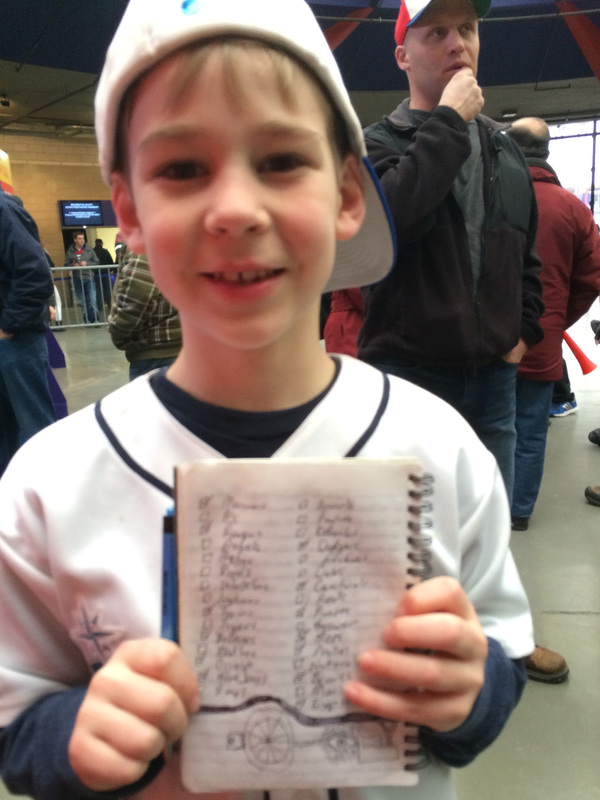 …he’s pretty much “at home” at a ballpark. Oh, look, there is Chris and Natalie (above, behind Tim). See that yellow line with the arrow pointing to it in the photo above? At 5:15’ish, they waved us by. There was a mini-frenzy. We thought we were heading into the ballpark, but really we just rushed up to and then were stopped at that yellow line (where there actually was a yellow line on the ground). We stood there for the next 15-20 minutes. But then he did it. “On veut ‘baseball! On veut l’baseball! 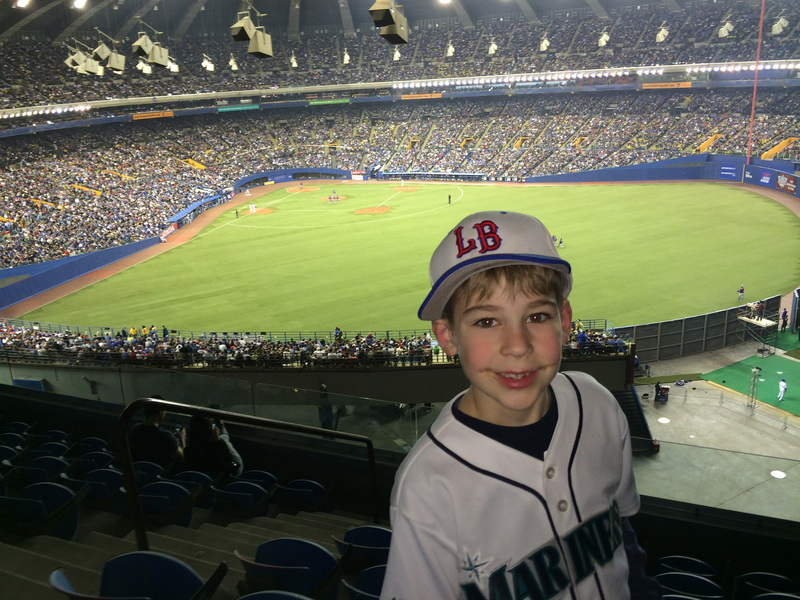 On veut l’baseball!On veut l’baseballOn veut l’baseball” (repeat, repeat, repeat…). The TV cameras and running over immediately! Then an usher (the one at the left side of the yellow line in the photo two above) came over and told Jose Vidro a better way to say it in French. 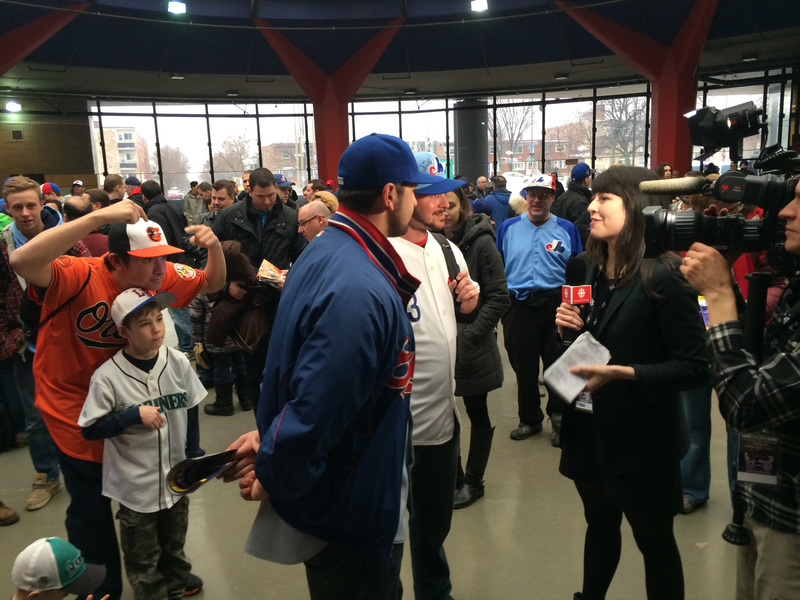 “On veut du baseball! On veut du baseball! 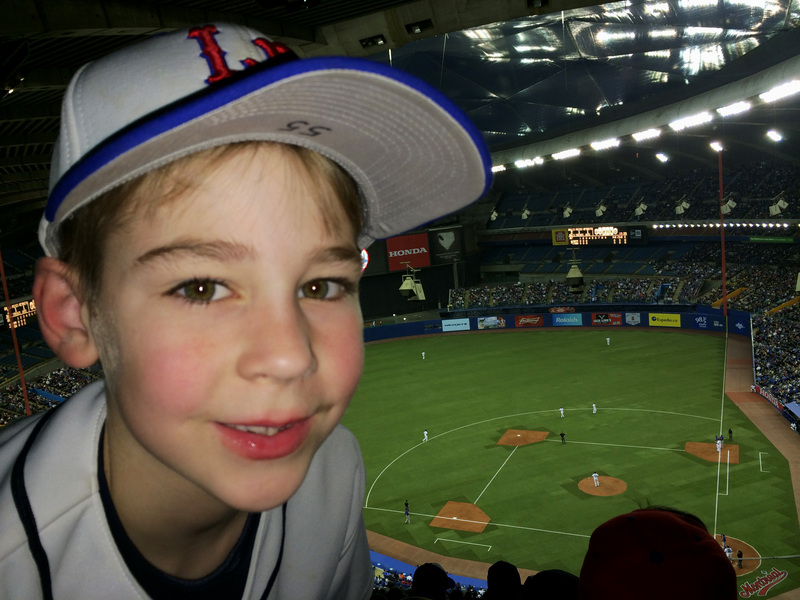 On veut du baseball!” (repeat, repeat, repeat…). It was pretty cool. Definitely, unlike any baseball stadium gate experience we’ve ever had. With all of the chanting and the video cameras and the flash bulbs popping, the anticipation to enter the stadium was palpable, you could feel it all around. And then we got the word, and every rushed forward, with Tim running along with me and Kellan sitting on my shoulders. 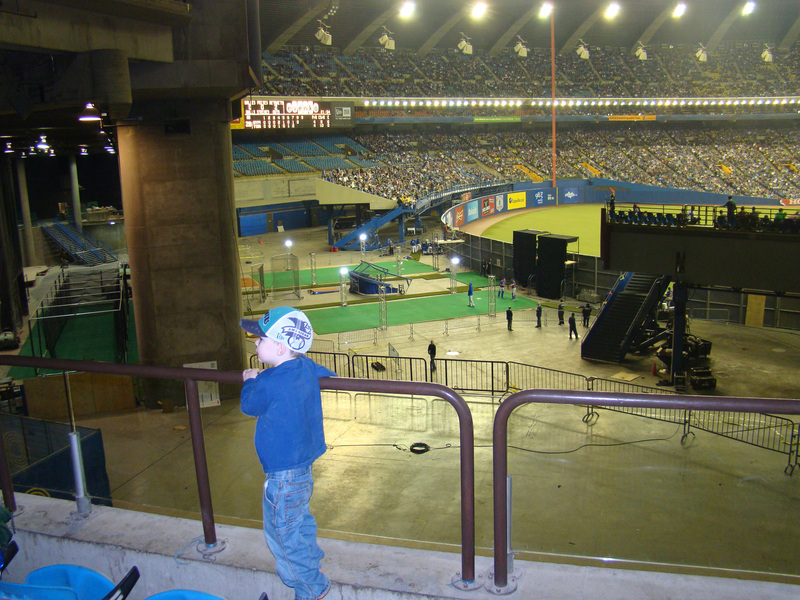 There were no scanners so the lady had to rip our ticket stubs (it was 2004 Montreal ticket technology), and then we ran through unfamiliar concourses to what felt like it should have been the third base side. Eventually, we popped out of a tunnel just above the third base dugout. The Mets were on the field taking BP. We ran down to the dugout to see the action close up. Bob Geren was playing catch in front of the dugout using two baseballs. As we approached, I called out a big “Hey, Bob!” An usher on the field, apparently unaware that it is okay to speak to players and coaches, reprimanded me. Avi laughed, he couldn’t believe I was reprimanded for saying hi to Geren. Geren didn’t mind. He finished playing catch within one minute, and he immediately turned and tossed one of the balls to Tim (he caught it) and the other to Kellan (he scooped it off the top of the dugout). The first ball was a 2013 World Baseball Classic commemorative baseball and the other was an Angels’ 50th Anniversary baseball. (By the way, I’m not a fan of “does it count” debates. We wouldn’t “count” balls from normal spring training games, but this was an exhibition game with 46,000+ crazy fans at a 27-year official MLB ballpark. You better believe we’re “counting” these baseballs). Anyway, we started heading out toward LF and taking lots of pictures. Once we got out to LF, Michel taught us how the fans slam the seats down to make an incredibly loud *clack* *clack* *clack* sound. When they really got going, Tim commented (and he was right on) that it sounded like a train rattling through the stadium. So he is the deal. I absolutely love domed baseball stadiums. 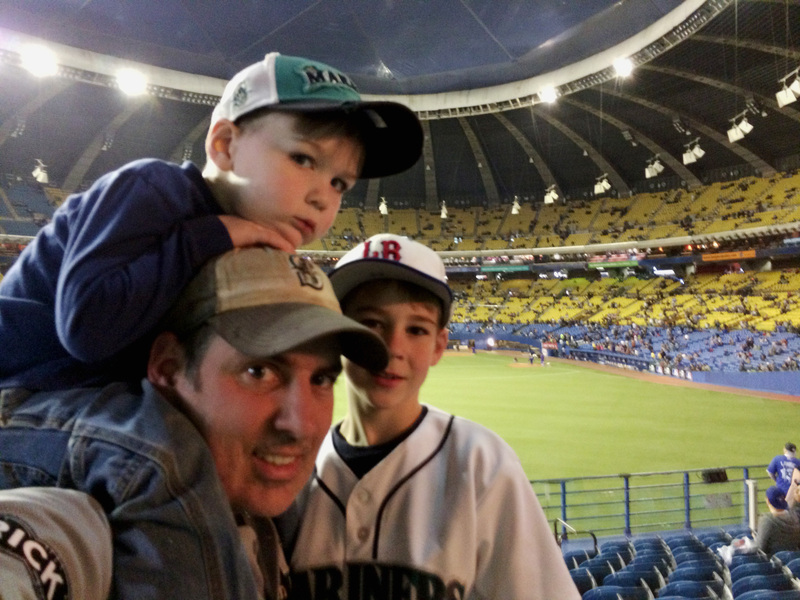 The Kingdome is my all-time favorite stadium because it was my baseball home for the first two decades of my life, and it was glorious. I loved the Metrodome. 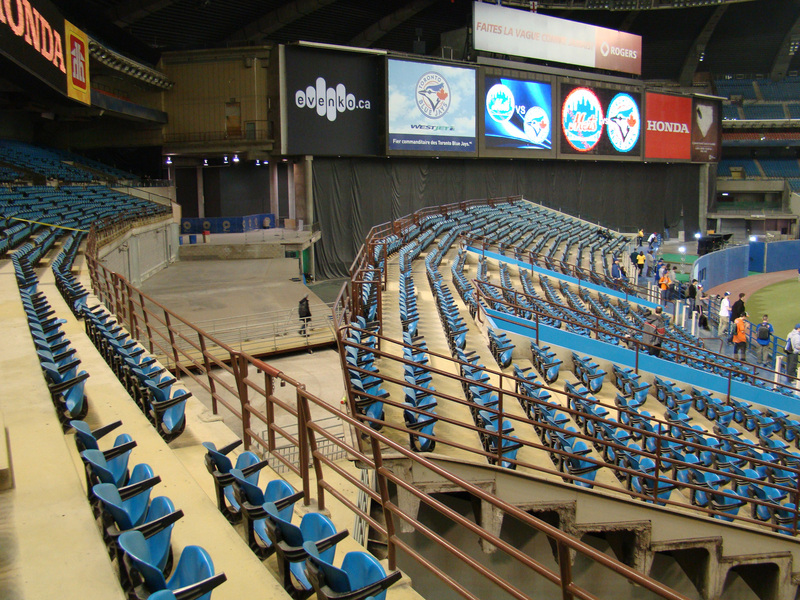 I loved Tropicana Field. 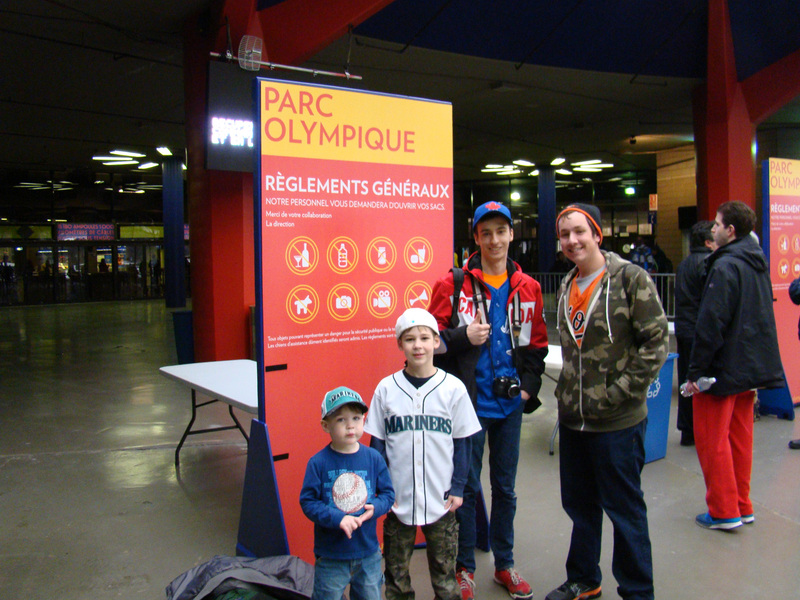 …I officially fell in love with Stade Olympique!!! I mean, come on!? How amazingly beautiful is that?? Have you ever seen something like that at a Major League ballpark? (No! No, you haven’t, unless you’ve been to Olympic Stadium). So, my understanding (from Chris Hernandez) is that the LF seats are on a hinge (so to speak) in the LF and RF corners, and they swing forward to form the outfield bleachers for baseball games, or they swing back into the gap shown above to accommodate soccer. Whatever the reason, I absolutely loved this massive (behind the scenes) dead zone. Truly a beautiful sight. Oh, yeah, while we were out in LF checking everything out and watching BP, a stadium worker guy kept going down a flight of stairs on the CF end of the bleachers to retrieve homeruns that cleared the LF bleachers. He’d then give the balls to fans. He ended up giving Tim two baseballs, one was another Angels’ 50th anniversary ball and the other was a Dodger Stadium 50th anniversary baseball. 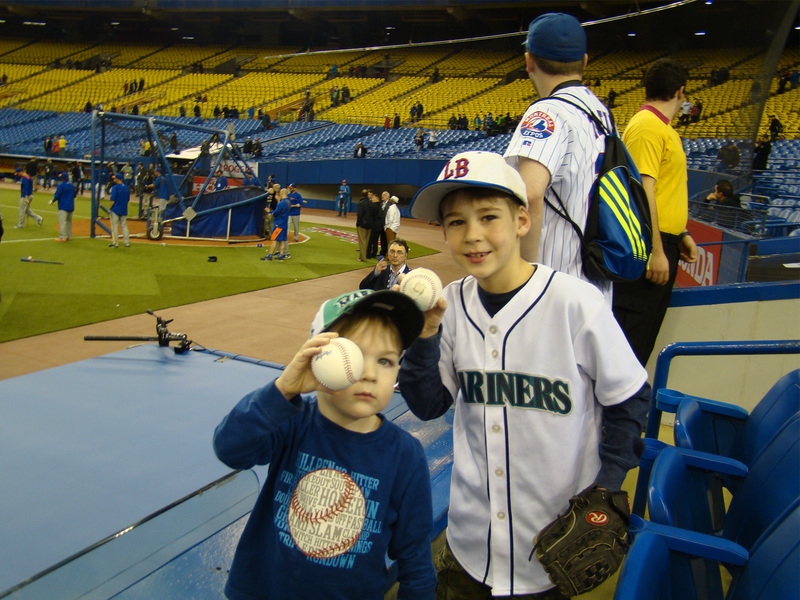 By the way, I did not see a single non-commemorative baseball used during BP either at this game or the game the following day. That’s a scene you don’t see much at an MLB game, huh? Those fireworks were for Blue Jays post-homerun celebrations. After BP, I took a quick selfie before the boys and I headed off to explore (Avi was off exploring on his own…or maybe with some of the other guys…at this point). The tunnels in the LF bleachers excited through long ramps (that you can see in the *dead space* photo above) that lead into the lower, field lever concourse (there are two different concourse for the field level – this one that is accessed through mid-field level tunnels and another accessed by walking all the way to the top of the field level). All of the food places had their menus in French (I wondered all weekend what “arachides” and “croustilles” are…I could figure out “biere”). The other thing (above to the right) with the green door opening is the weird restroom set up. They were all in the middle of the concourse and had ceilings that did not reach the concourse celing. As we walked toward the infield, there was a ton of stuff in the concourse (most of which came out blurry in my photos). 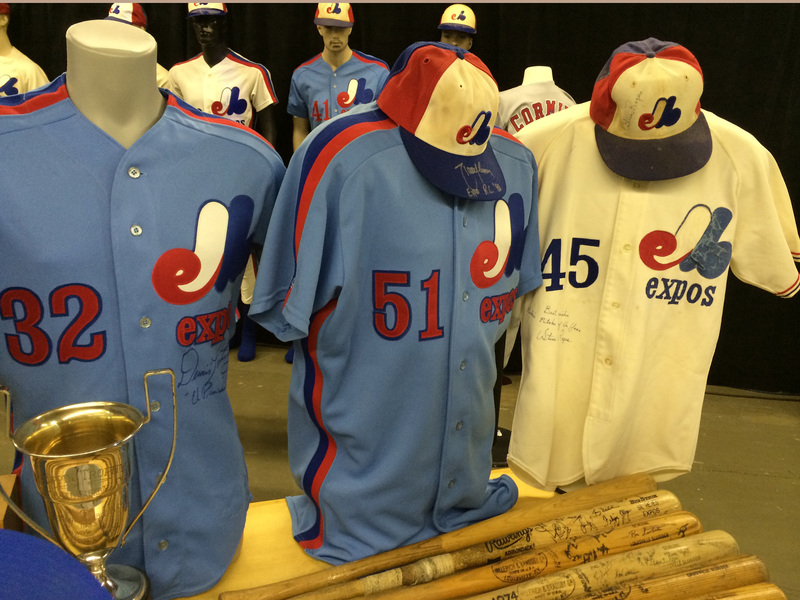 There were games, info booths, photo booths, Expos booths, Blue Jays souvenir booths, and food stands of all sorts. 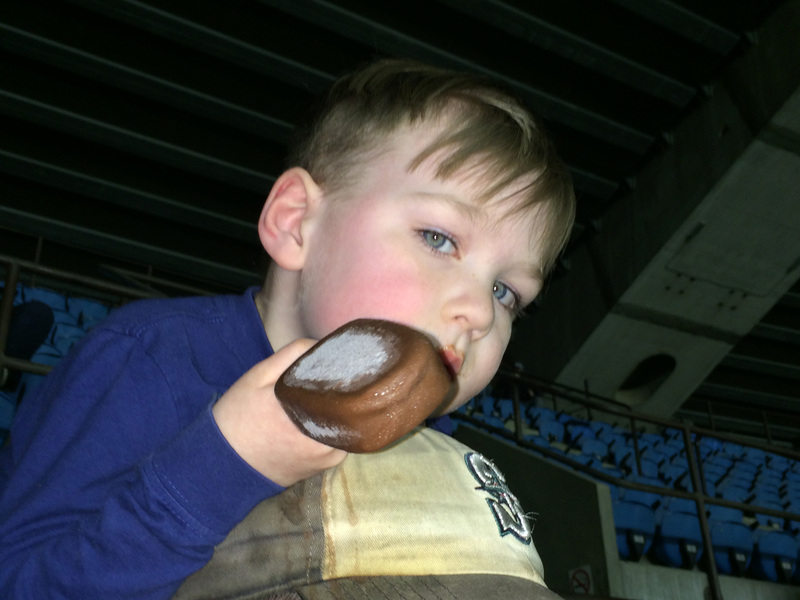 …and a Tim Horton’s mascot suiting up in the restroom. We decided to get some food. We got in a line that had hot dogs (which was conveniently listed in English). The line was taking forever. It wasn’t moving at all. Then someone behind the counter yelled something in French. I had no clue what was going on. 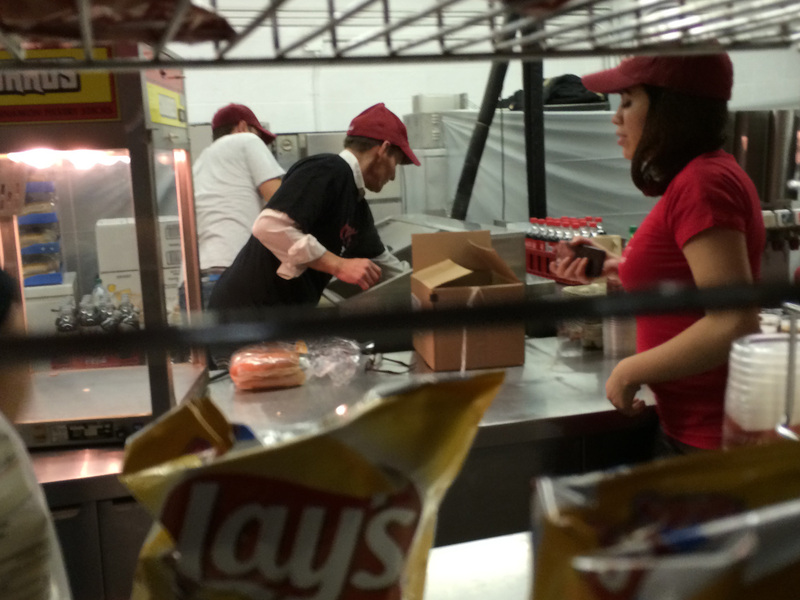 Turns out they were out of hot dogs and needed to prepare more. This would be a common theme. …was walking down the ramp. He came over and asked if we were the Cooks. He recognized us from this blog. (Hi, Max!) We chatted for a few minutes. 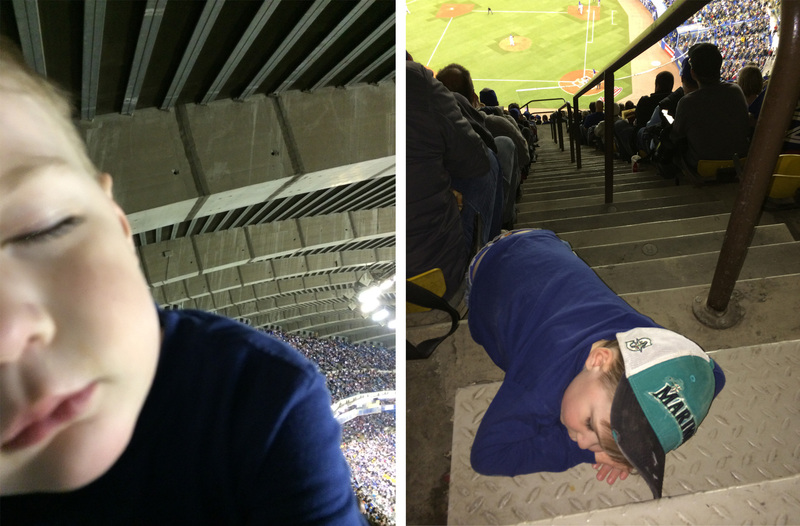 He’s a ballpark chaser and was very happy to be at Olympic Stadium (but, I think, it wasn’t his first time). These ramps were different than most of the ramps at the ballpark. We’ll see some of the others later. …who (two pitches later) tried to bunt his way on base. I thought Kellan was really tired, but it turns out he felt a little under the weather, which resulted in a lot of napping during the first half of this game. One funny thing that happened while we were up in our seats is that a fan started chanting “Let’s Go Blue Jays!” When no one in the crowd followed his chant, he yelled something to the effect of “That’s why you guys don’t have a baseball team anymore! Enjoy your baseball team guys!! !” It seemed very un-Canadian of him. I thought these guys were supposed to be the most polite people in the world? Two cross aisles cut the field level at Olympic Stadium is cut into three parts. Those yellow tunnels at the bottom of the middle section take you out to what I previously called the “lower field level concourse.” But you could also follow stairs all the way from the field up through all three parts of the field level to an “upper field level concourse” behind the top part of the field level. Elsewhere, there was a 300 level (suite level) concourse and a 400 level (upper deck) concourse. 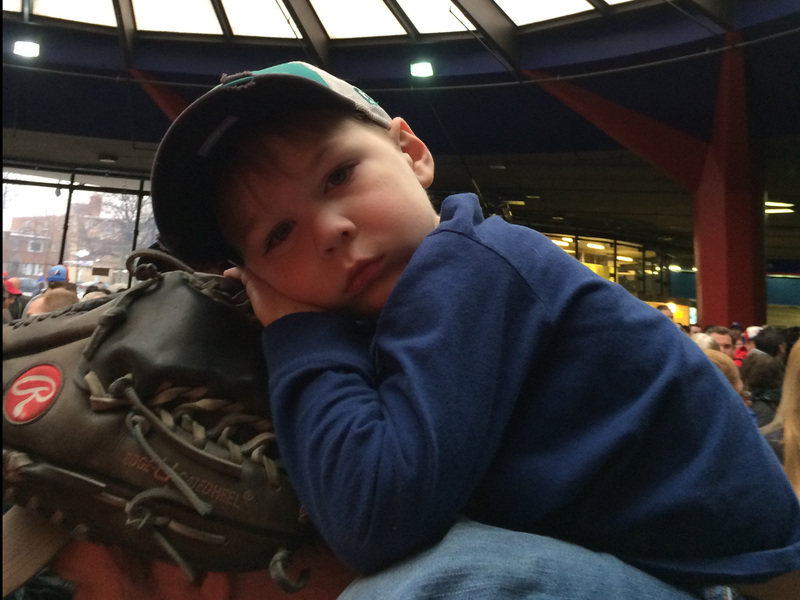 After about three innings, we headed down to the 400 level concourse because Tim wanted to explore. The 400 level concourse was naturally divided into two parts, which I’ll all the front (field-facing) and back (exterior-facing) sections. …while the front half was clogged with numerous seemingly endless lines snaking their ways to the various food and drink stands (like this make-shift biere stand). Check out the huge flat surface (complete with table and chairs) on top of/behind the scoreboard in centerfield. How weird is that? And what in the world is the purpose?? By the way, see the black boards to the left? That is the boundary with the construction zone. Oh, yeah, see all the smoke in the picture (above the RF bleachers)? We totally missed it because we were in the concourse, but Jose Bautista blasted a home run to LCF (that apparently went right over Chris’s helplessly outstretched arms). That made the score 2-1 Mets in the bottom of the fourth. He just sat on my shoulders holding it for a while until he finally told me to eat it. Eventually, Kellan needed to head to the restroom. He was acting like he was sick and I was getting nervous. I really thought we needed to leave the game and head back to the hotel so he could rest in bed, but there was a problem. We had no clue where Avi was. Because we were in Canada, neither of our cellphones worked so I couldn’t call him. As Kellan headed into a stall claiming he needed “privacy,” Tim and I stood outside the stall and discussed what we would do. The plan was to meet behind the third base dugout after the game. But Avi could be anywhere at this point. My only thought was to find Chris and Natalie who we hoped would be in section 402 (where their seats were located) and have them relay to Avi after the game that we had already headed back to the hotel. And for the rest of the night, totally normal, non-sick feeling Kellan was back. By the way, while we were in the restroom, Travis d’Arnaud hit the second homerun of the game (in the top of the seventh inning) to make the score 4-2 Mets. And then we headed off to get Kellan a popsicle, but this time it was a real popsicle, which I thought would be better for him if he was still feeling sick’ish at all. In the photo above to the right, those are the insides of the black windows that are at the bottom of the exterior of the stadium. That’s former-Mariner and international baseball sensation, Munenori Kawasaki, in the process of smacking a single. He and Maicer Izturis (who was already on base) later scored on a game tying single by Edwin Encarnacion. Finally, we made it out to deeeeeeeeeeep LF, to the seats that would be the top part of the field level if the LF bleachers were pushed back. Most of these seats were not sold, and were actually roped off. But the usher did not seem to care if people disregarded the rope. This is, personally, one of my favorite panoramas I’ve ever taken. From the rest of the stadium, the CF area just looked like a black batters’ eye and a scoreboard, but from this view we got a behind-the-scenes peak, literally behind the batters’ eye and scoreboard. And as a bonus, we got to watch Bobby Parnell warm up in the eighth inning (in the closer of the two make-shift bullpen). 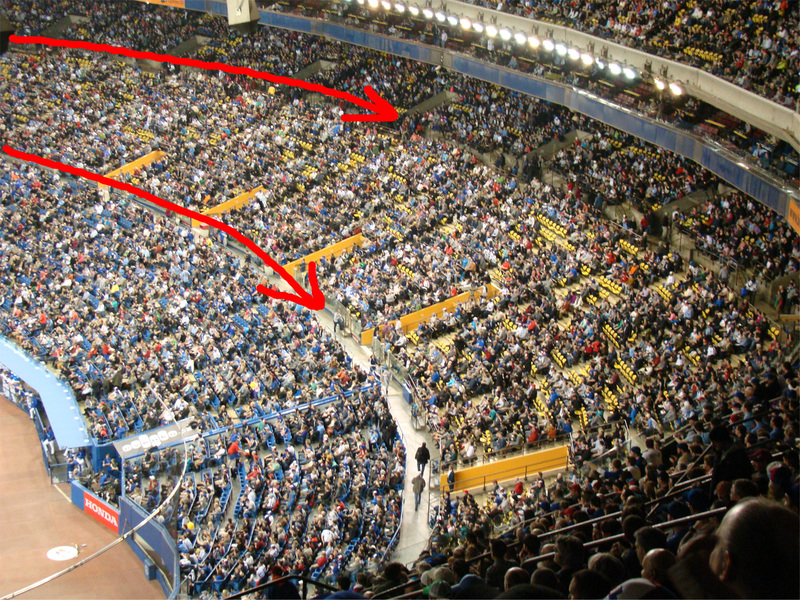 From this cross-aisle, we could just barely see over the LF bleachers to watch the batter-pitcher matchup. 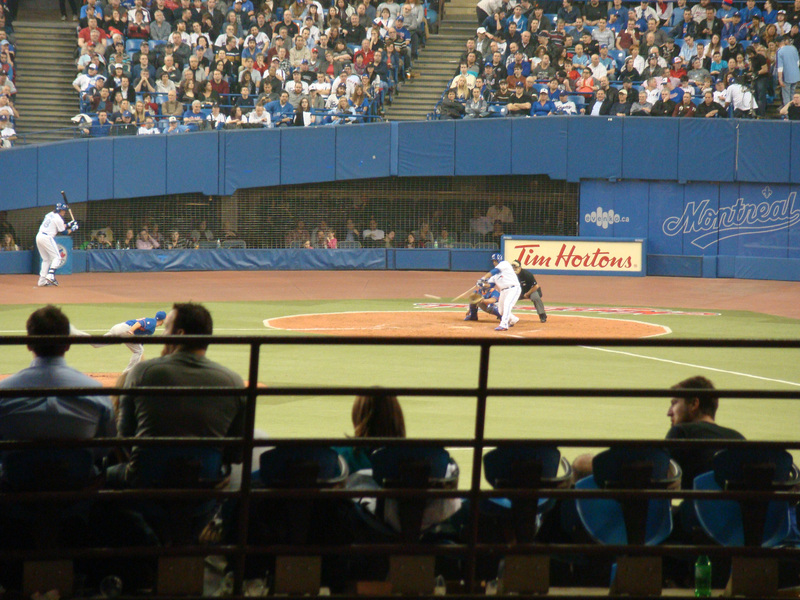 Of course, the view of LF was a *bit* obstructed. But what really makes that last picture just perfect is the “Tim Hortons” sign. As far as I know, Tim Hortons is the most Canadian thing in the world (although, from my limited sampling, Tim Hortons seems to be much better represented in Ontario than it is in Quebec). Finally, check out the seats *under* the field level seats. Those are pretty cool. 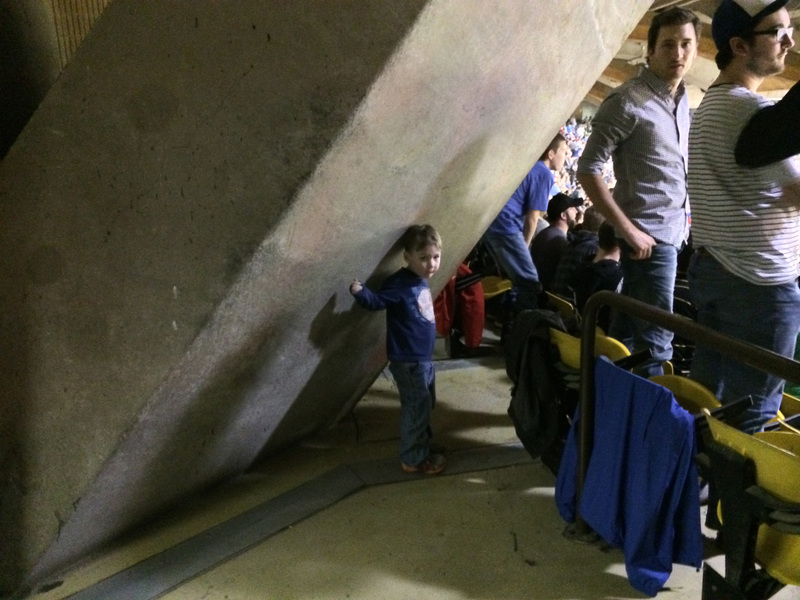 We had been hanging out right where Kellan is standing in that photo for the last 10-15 minutes. There was so much to see, I couldn’t get enough of it. At one point (while Parnell must have been taking a break between warm up pitches), Mets bullpen catcher Dave Racaniello looked over and exchanged some waves with the boys while he was still in his crouch behind home plate. When Parnell got called into the game, “Rac” walked over to the short fence just off the edge of the bullpen “grass.” He was right in the middle of the length of the bullpen, by the light tower. It was clear that he was contemplating whether he could toss us Parnell’s warm up ball. That last picture is a little misleading, it looks sort of close. But, trust me, this was a long way away. Not only was it a long distance, we were two levels above Rac. I pulled the glove off my head, popped the pocket with my fist and extended my arms to give Rac a big target. 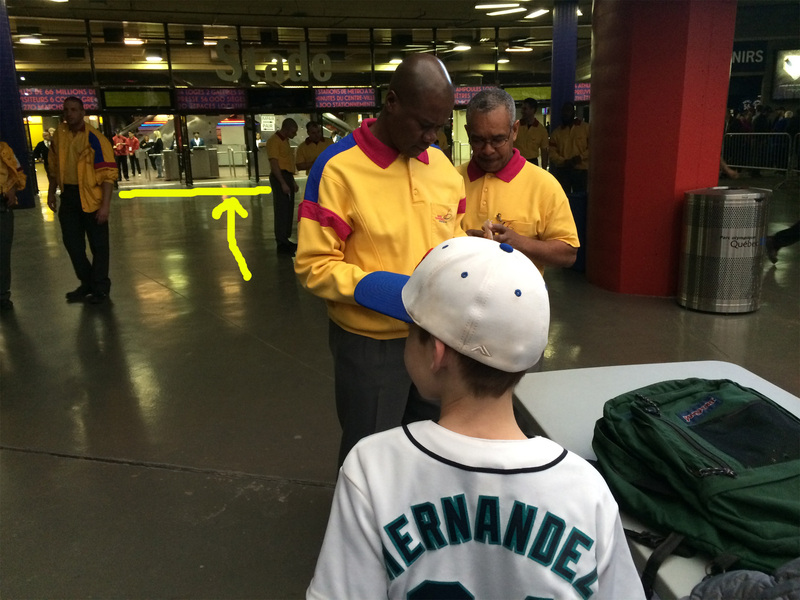 I also scooted back a bit so I wouldn’t be at the railing – I sort of lined up with a closed off tunnel to the concourse. Rac made some exaggerated grabbing-his-shoulder-and-rotating-his-arm gestures as if to say, “I don’t know if I can make it up there!” And then he unloaded a perfect throw. The ball sailed above me, arched like a low lower on its descent, and then it went directly in line with the lights on the far side of the stadium. I stuck out my glove hoping I would be able to fend off the lights. And then the ball emerged from the lights and smacked into my glove. It was truly one of the coolest toss ups I’ve ever been a part of or even witnessed. We all yelled big *THANK YOUS* down to Rac. Parnell got out of the eighth and the game moved to the ninth tied 4-4. Do me a favor, click on that last panorama to see the enlarged version. See the RF bleachers. Do you notice how there are just a two ushers wearing bright yellow sweaters? 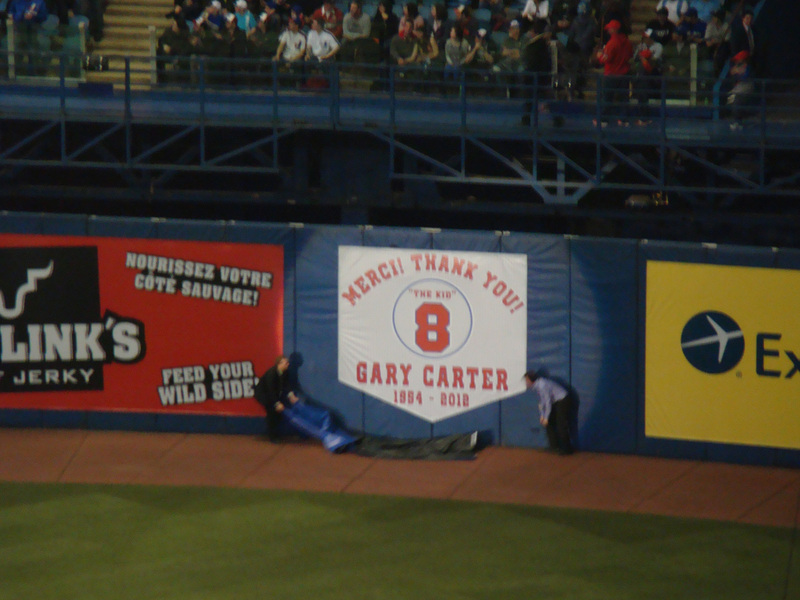 One is in the CF corner (above the “W” of the “Westjet” show and another in the tunnel between the Rolaids and Jack’s Links signs. Just remember that, because that is the “normal” amount of bleacher ushers. We wandered around a little bit looking for Avi (who should have been easy to spot due to his bright orange Orioles jersey). 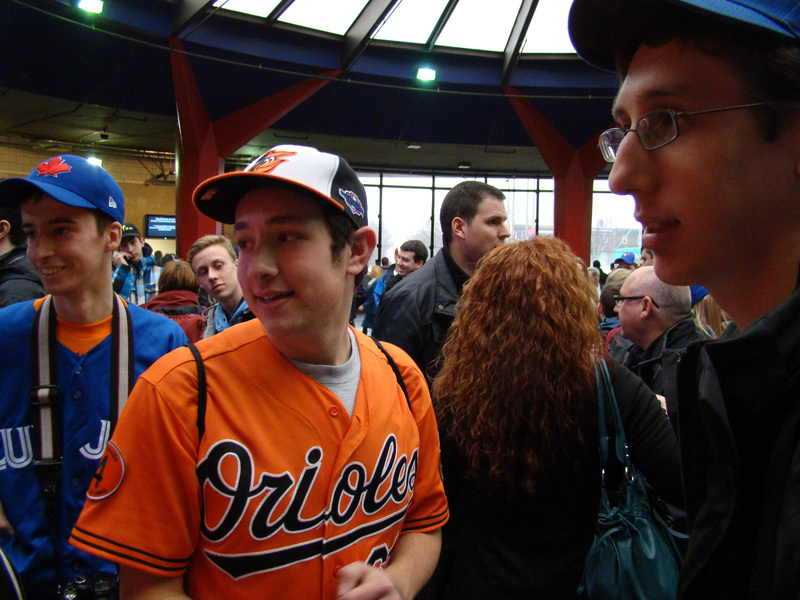 We found some other O’s fans in our quest, but didn’t see Avi quite yet. Okay, now click on that photo, too, to enlarge it. See the RF bleachers?? I now count at least eight yellowe-sweater-clad usher in the bleachers, all scattered through the front cross-aisle in the CF-most part of the RF bleachers. It’s sort of hard to tell, but you can subtly notice that for the most part they are all leaning forward looking over the railing. We did not know at the time. But just before I took this photo, a 40’ish year old (and probably intoxicated) Blue Jays fan climbed up the railing in a failed effort to start the wave, and he ended up falling over the railing to the concrete floor below. I’ve read articles saying it was anywhere from a 20 foot to a 50 foot fall. He was taken to the hospital in critical condition, and I’ve never heard an update. Hopefully he is improving. His fall would have an impact on the rest of the weekend. Tim went down and joined them for the rest of the game while Kellan and I took it in from the cross-aisle, where no one cared that we were standing. In the bottom of the ninth, Muni Kawasaki hit a double and eventually scored the winning run on a walk-off single by Jonathan Diaz. We lingered as long as we could before Chris, Natalie, Michel, Avi, the boys and I all headed to the Metro, which was an absolute zoo. Avi and I had pre-paid passes and Kellan was free, but we though we needed to buy a return fare for Tim (who had been comp’d on our way out to Pie-IX by a Metro worker who seemed to like us. The line was too big for Chris and Natalie, they went to another station down the block. The rest of us waited through an incredibly long line to buy Tim’s return fare. Michel volunteered to do the talking (in French). When we got to the front of the line, we found the same lady who had comp’d Tim going the other way. This time, she told us that it was free for Tim because it was after 6 p.m. So we all rode the Metro back downtown. With the caveat that we were the Mariners fans that we saw, all we needed on Saturday was to find fans of the Rays, Rockies and Cubs. Pretty good! 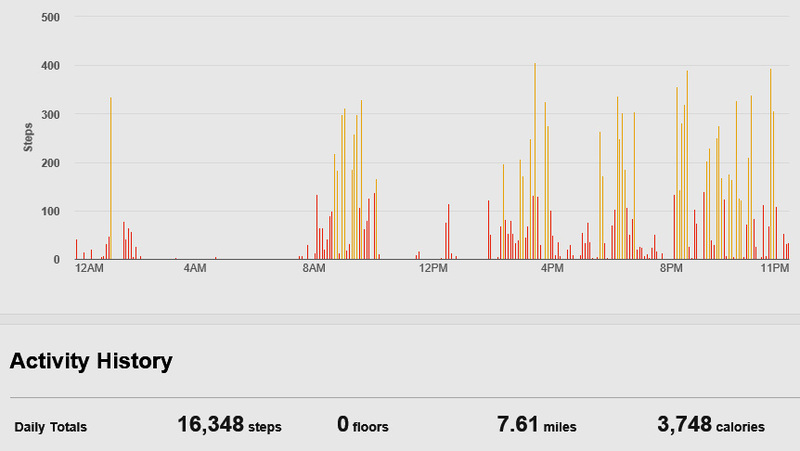 I walked most of those 7.61 miles with Kellan on my shoulders…and my back was about to pay the price. All-in-all, it was an incredible first day of the baseball season for us. We had an absolute blast and we couldn’t wait to get back at it the next day.